Flywheel recently acquired Pressmatic, and turned Pressmatic into a Free product, naming it as ‘Local’. But for all those who purchased Pressmatic please do not fear. You’ll be able to avail of the upgrade ‘Local Pro’ exclusive for then-Pressmatic users. If you are ever in doubt, please contact Flywheel Support at help@getflywheel.com and they’ll get back to you shortly. Or, you could check the Community like ‘Local Pro for Pressmatic Users’. Once you’re confident, let’s head on to replacing Pressmatic with Local by Flywheel, the way forward! First off, go ahead and Download the near-500 MB zip file over at the Local Flywheel landing page. Then whilst we’re waiting for the download to complete we might as well head over to Step 2: Remove Pressmatic. 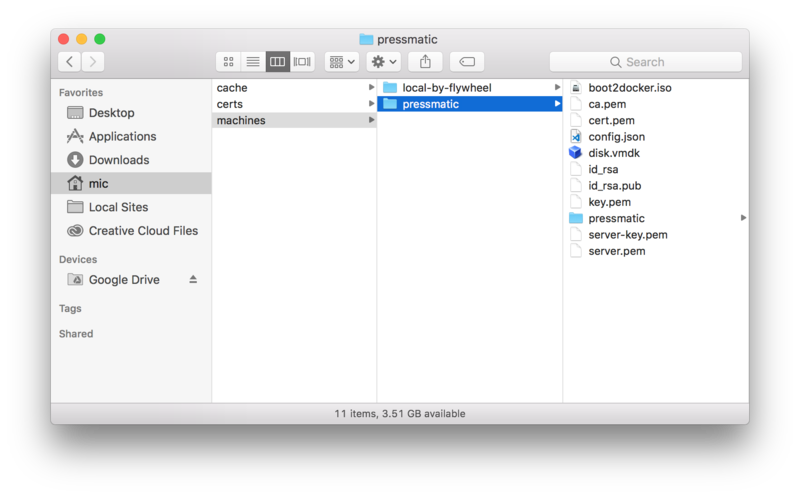 To remove Pressmatic, open your folder ‘Applications’ which will be at the sidebar if you open your app ‘Finder’. Quick tip: Use the keyboard shortcut ‘CMD+Spacebar’ to open up the Spotlight, and type in Fin, Find, or Finder and press ‘Enter’. That should open up the Finder app for you quickly. Or you could simply use your Mac Dock, or then again use the ‘CMD+Tab’ to tab your way through. Once you are in, just use the keyboard shortcut CMD+Delete to throw Pressmatic into the Recycling bin, or you could drag Pressmatic into the Recycling bin. Now, we’ll have to remove the machine created by Pressmatic. Open up your Finder app, and press CMD+Shift+G. And delete the Pressmatic folder. We’re done! Next let’s Unzip that newly downloaded file from earlier. Once that’s done, Drag the app ‘Local’ into your folder ‘Applications’, or you could then again use a keyboard shortcut on the app ‘Local’ using ‘CMD+X’, then click somewhere in your folder ‘Applications’, and use the keyboard shortcut ‘CMD+V’, to paste your Local app. You’ll want to check out if Local is working properly or not. 99% of all cases it will. But if ever you have any problems you could be the 1% that bugs occur. If so, please visit the Flywheel Community here and address the problem as simple as ‘Could not install Local’, and they’ll ask you questions along the way. Learn more about Flywheel here.